Creating Daylily seeds is very simple regardless of your gardening experience. Simply take the pollen from one flower and dab it onto the pistil of another bloom. One important part in attempting to make crosses is the ploidy, diploid daylilies cannot be crossed successfully with tetraploid daylilies. The easiest way to begin is to remove a stamen, the male part of the flower. At the end of the stamen is the anther which holds the pollen. Hold the stamen and just brush it's pollen onto the pistil, the female part, of another flower. Recording the cross and keeping good records is important. A common method is to use the white paper "string tags" that are generally used for marking prices. They are available at office supply stores or in the office supply department of places like Target and Walmart. The lettering must be able to withstand the elements, I have found that a number 2 pencil works the best. 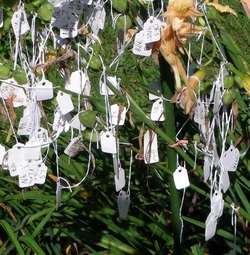 Write the cross on the tag, and then loop it around the bloom you have pollinated just below the flower. The flower will drop off in a few days, and if the pollination was successful, a small green seed pod will be at the base where the bloom was. It will slowly grow larger and your seeds will be ready to harvest in 6 to 8 weeks. A mature seed pod will brown and split open, keep a close watch so that your pod doesn't open and spill it's contents. As soon as the pods start to crack, you can harvest the glossy black seeds. When I gather seeds, I fill my pockets with sandwich size zip-loc bags. I remove the pod along with it's tag and put both inside one bag. Once in the house, I split open the pods to dry the seeds for 24 hours. I find that round coffee filters work and save a lot of counter space. Simply get a big bowl and put a coffee filter in it put the seeds along with their tagon top of the filter, add another filter on top of that one for the next cross and keep layering. You do have to use a bit of caution when removing each filter after drying. There are lots of different drying methods, some ideas are paper egg cartons, paper plates, paper cups, napkins .... the idea is to use something that will absorb moisture. 24 hours of drying is sufficient, but if you don't get to them, there's no harm done if they sit longer. After your seeds have dried, it's time to package them for storage. Some things you can use are envelopes, those brown coin envelopes, sandwich bags, or those small zip-loc bags sold in craft supply stores. The main thing is to have the cross clearly marked, you don't want to loose the parentage after all your work. I prefer the small zip-loc bags from the craft store, they are inexpensive and I like to be able to see the seeds. I either write the cross on the outside of the bag with a permanent marker or write it on a piece of paper and put it inside the bag with the seeds. Either way, it's a good idea to add a small piece of paper to the bags to absorb extra moisture. A tiny piece of paper towel is sufficient but this is not absolutely needed. I put all the little bags inside a large zip-loc bag and stick the bag in the fridge. It's common practice to refrigerate seeds for at least 3 weeks before starting them (they can stay in the fridge for over a year and still be viable). Refrigeration increases germination rates especially if the parent plants have some degree of dormancy. If you want more detailed information there is a great article on "How to Hybridize", by Paul Owen, in the Summer 2009 AHS Journal on page 50.